Llangollens hideously ugly Bremach L4P AU10ABZ and Volvo/ Saxon WrL PN04WKA in Market street carpark on 13/11/2011. 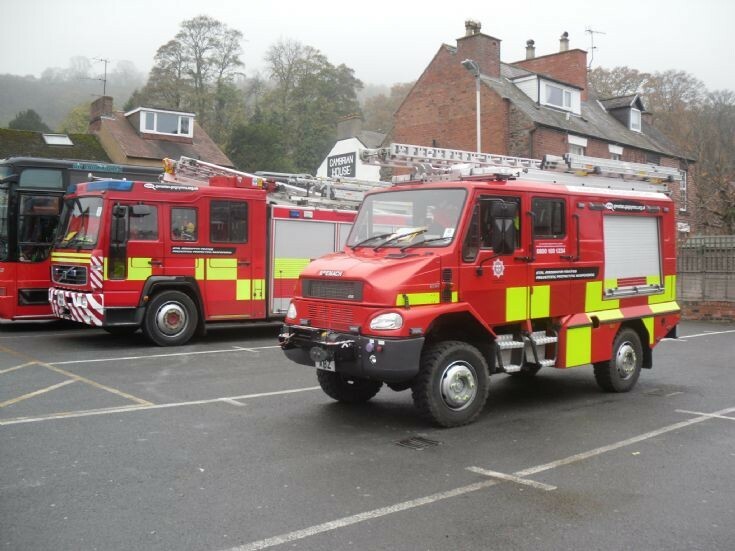 Compared to the Iveco light pumps created for Devon and Somerset Fire and Rescue Service this one is quite easy to the eye! Added by Mike & Helen on 16 November 2011. They're quite attractive really compared to that ghastly Renault that used to be at Ruthin and then Llangollen, N21 DJC. Added by Andrew Middleton on 17 November 2011. Beauty is in the eye of the beholder, as they say. Very tall and narrow leading to a dubious cornering ability though. Once saw N21DJC on blues and twos by Bridge End Llangollen, it certainly had a turn of speed. Added by Gary Simpson on 17 November 2011. Added by Alan on 17 November 2011. Hi Gary! I can´t say nothing but UGLY!!!! Added by Anders Fallström on 14 August 2014. Are not the looks the best bit?!! Added by Neal Glover on 14 August 2014. Pinz were never a Swan, but they certainly are miles ahead in off road capability than these raggy dolls. Added by Gary Simpson on 15 August 2014. I see 3 have fallen over on Llantisillio mountain. I am surprised it took so long. Added by Neal Glover on 05 August 2018.